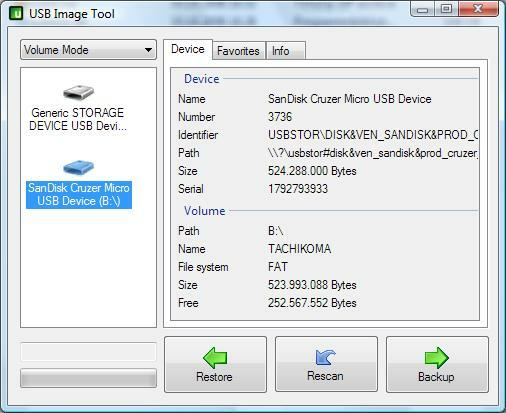 USB Image Tool works with any device, that implements the USB Mass Storage protocol. This includes flash drives, card readers and a lot of other devices, like digicams, cell phones and mobile music players. Download zip archive and extract to any folder. Writes empty registry key at [HKEY_CURRENT_USER\user\current\software\alexpage.de]. Program has options to save and remove settings in registry. I listen to at work. USB Image Tool v1.70 released (changelog at http://www.alexpage.de/usb-image-tool/changelog/). DotNET dependency raised to v4.0. Midas wrote: DotNET dependency raised to v4.0. Ugh. Why would they do that? Of all programs, USB tools need the fewest dependencies.